Children experience prayer methods from many different cultures - memorize the Lord's Prayer, walk a labyrinth, use yoga & guided meditation, understand intercessory prayer & prayer shawl ministries, pray or chant the Psalms, modify Tibetan prayer flags and MORE! Other experiences include exploring how pretzels & prayer are connected, using ribbons to understand & remember the Lord's Prayer, and learning about corporate prayer. Appropriate for K-5th Grade. pay one low annual fee to access to ALL units. Use for Sunday School, VBS or special events --- a great way to stretch your budget!! You can purchase cycles individually or purchase an annual congregational membership. 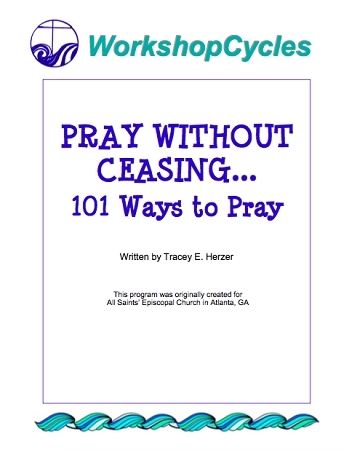 Congregational members get access to all cycles and can download as many as are needed in a given year. You can download a cycle and if it turns out that you don't want to use that one, just download a different cycle without wasting the cost of a cycle you don't use. Plus, you can use cycles for special occasions (Christmas, Lent, etc.) and they are great for a VBS or Summer Camp program as well as Winter Camp, which is a growing trend in churches today -- the week after Christmas when parents need child care and children are eager have fun and learn.